Will discuss her program to increase literacy & her career - SOLD OUT! You are invited the luncheon at the Press Club on Tuesday, February 10, 2009 with Dolly Parton. 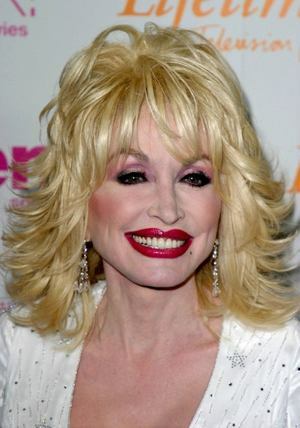 Parton created a free book distribution program in 1996 as a way to increase literacy in the region where she grew up. Every child in Sevier County, Tenn., is eligible to receive a free age-appropriate book each month in the mail until the age of 5. The program has since expanded to two other cities where Parton's businesses operate. Parton, who discussed her literacy program in an NPC luncheon in 2000, has donated an autographed book to the NPC 5K run/walk scholarship fund-raising auction each year since then. "They say that you're never so tall as when you stoop to help a child. I'd better not be stooping had, I? I think I'll just stand up for the kids. And a few years ago, I started a public foundation called the Dollywood Foundation. And that's to help kids in my home county. We started out to help the high school dropout rate, and we did, too. In fact, we were able to change it from over 30 percent to less than 6 percent in about five years. And I'd say that's pretty good." This is a return visit for her; the first, many years ago, sold out, and this one will, too. Given her musical, acting, and entrepreneurial, plus her self-effacting wit ("I spend a lot of money to look this cheap. "), you should join us so that you, too, can say, "Hello, Dolly." When: Tuesday, February 10, 2009, 12:30-2:00 p.m.
“I’ve always been a writer. My songs are the door to every dream I’ve ever had and every success I’ve ever achieved,” says Dolly Parton of her incredible career, which has spanned nearly five decades and is showing no signs of slowing down. Always dreaming and always looking forward, Dolly is busier than ever. Writing the music and lyrics for the upcoming Broadway musical version of 9-5, working on various children’s projects, and writing and recording a new album, “Backwoods Barbie,” which set for release in February 2008; these projects are just a few of her many interests at the moment. The phenomenon of Dolly Parton continues to flourish, as she remains one of world’s true superstars.